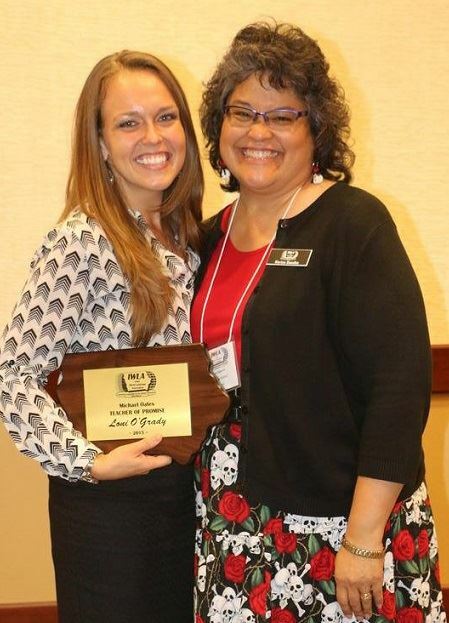 Des Moines, IA—The Iowa World Language Association (IWLA) is pleased to announce a 2015 Friend of IWLA has been given to Bea Houston, current Activities Director and Faculty Development Specialist, and former Spanish Instructor at Western Iowa Technical Community College in Sioux City, IA. The award presentation was held during the Luncheon of the 2015 Iowa World Language Association Annual Conference at the Downtown Mariott in Des Moines, IA on Friday, October 9th. Since 2008, Bea Houston has worked tirelessly as the Annual Conference Membership and Registration Chairperson. Being the sole registration person, Bea has sacrificed attending many conference sessions to be available during the busy times. IWLA Treasurer Stacy Amling notes, "Bea always has a quick smile and a ready answer for attendees who stop by the registration table with questions or conference feedback." Bea has also served as the community college representative on the IWLA Advisory Council, and has been active on the Executive Board for the Iowa chapter of American Association of Teachers of Spanish and Portuguese, working as Secretary and Treasurer for that organization. IWLA would like to thank Bea for being a Friend of IWLA. 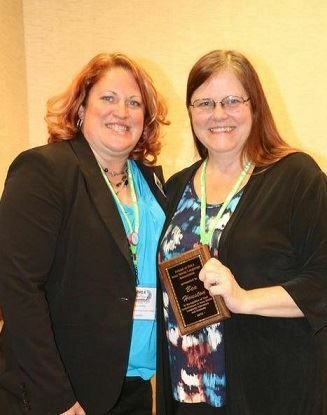 Des Moines, IA—The Iowa World Language Association (IWLA) is pleased to announce the 2015 Friend of IWLA Award has been given to Marcia Powell, a consultant at the Iowa Department of Education for Iowa Learning Online. The award presentation was held during the Luncheon of the 2015 Iowa World Language Association Annual Conference at the Downtown Mariott in Des Moines, IA on Friday, October 9th. Though Marcia has dedicated much of her life to educating Iowa's kids in the area of STEM, it was through her position at the Department of Education that she began working with Iowa world language teachers to develop state standards. Through her hard work, advocacy, and leadership, our state world language standards are now nearly complete. Although not a world language teacher by training, she has shown her commitment to multicultural education and outreach through projects to bring water to South Sudan and the Abdel Kadir project in Elkader, IA. 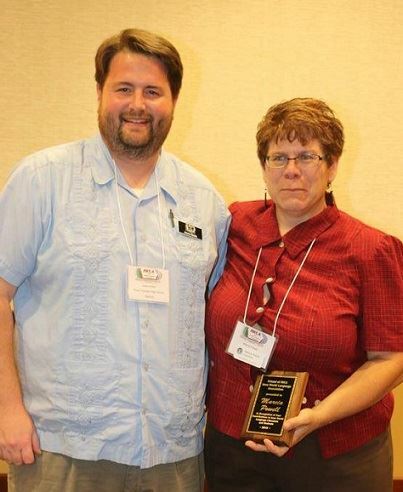 For her outstanding work, IWLA would like to recognize Marcia Powell as a Friend of IWLA. 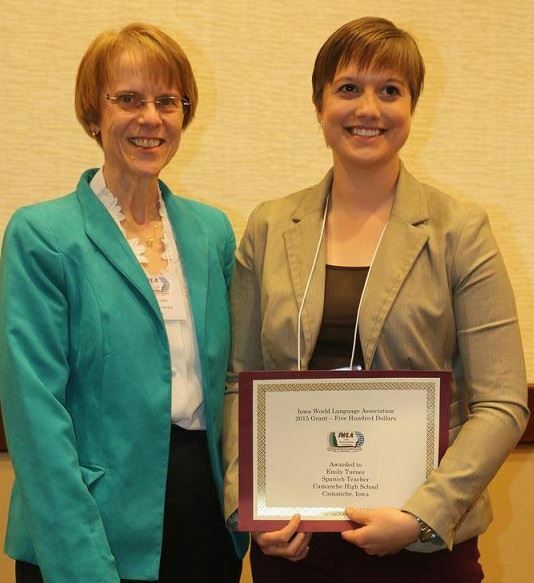 Des Moines, IA—The Iowa World Language Association (IWLA) is pleased to announce that a $500 Grant has been awarded to Emily Turner, a Spanish language teacher at Camanche High School in Camanche, Iowa. The grant presentation was held during the Luncheon of the 2015 Iowa World Language Association Annual Conference at the Downtown Mariott in Des Moines, IA on Friday, October 9th. Emily plans to use the funds to purchase TPRS novels for a collaborative literacy project. Students in her upper-level Spanish classes will interact virtually with Spanish students from another small school. The project will give students opportunities to enhance their reading comprehension as well as their interpersonal communication. IWLA would like to congratulate Emily as our $500 grant winner. Des Moines, IA—The Iowa World Language Association (IWLA) is pleased to announce the 2015 Teacher of Promise has been awarded to Loni O'Grady, a Spanish language teacher at Waukee Prairieview in Waukee, IA. The award presentation was held during the Luncheon of the 2015 Iowa World Language Association Annual Conference at the Downtown Mariott in Des Moines, IA on Friday, October 9th. Loni is, according to the person who nominated her, “the epitome of the teacher that this award was designed to recognize.” She is “the kind of caring, compassionate teacher that Mike Oates was to his students.” She is “an amazing teacher who expects and gets the very best out of her students when it comes to their language and cultural development, just as Mike did. Loni has endorsements in ESL and Spanish. She is fluent in Spanish and Brazilian Portuguese and has completed travel and work experience in 13 Latin American Countries. She has several years experience teaching in Mexico. IWLA would like to congratulate Loni as our 2015 IWLA Teacher of Promise. 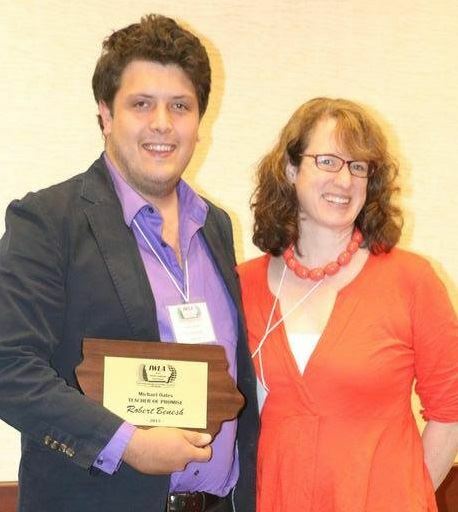 Des Moines, IA—The Iowa World Language Association (IWLA) is pleased to announce the 2015 Teacher of Promise has been awarded to Robert Benesh, a recent graduate with a Masters of Arts in teaching from the University of Iowa. He has endorsements in ESL and Japanese. The award presentation was held during the Luncheon of the 2015 Iowa World Language Association Annual Conference at the Downtown Mariott in Des Moines, IA on Friday, October 9th. One of his former professors described him as “inquisitive, thoughtful, iconoclastic, and sensitive to the needs of his students.” In describing his early experiences with Japanese, this TOP awardee stated, “I began to look at the world around me differently. Information and ideas I used to take at face value had taken on a new level of complexity as I learned that values and beliefs are a part of culture, and that every person in the world has a unique and equally valid perspective. I knew then that I never wanted to stop learning language.” IWLA would like to congratulate Robert as our 2015 IWLA Teacher of Promise.